Ernest Lindsay Thompson was born in 1870 at Millers Point, Sydney, the son of Lindsay George Thompson, former Chief Inspector of Fisheries, and his wife Agnes, nee Parnell. He was unmarried. He died at Manly on 5 February 1935, aged 65. A funeral service was held at St Paul’s Church in Burwood before his interment in Waverley Cemetery. Lindsay Thompson was articled in the City Architect’s Office. He established himself as a prominent architect who designed many of Sydney’s buildings. In 1910 he had premises at 52 Sydney Arcade, in King Street. He was a director of several companies and chairman of directors of Sargent’s Ltd. He was a keen cricketer, winning several trophies for his left-handed bowling. Thompson was on the executive of the New Guard. Thompson Place, a lane off the east side of Bourke Street was named for him. He lived in Burwood for 60 years. 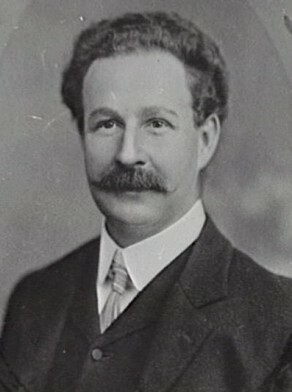 Lindsay Thompson was elected Alderman for Macquarie Ward, 7 December 1900 to 31 December 1927. He was a member of the Works Committee, 1901-27, the Health and By-Laws Committee in 1901 and 1912-16, the Health and Recreations Committee and the Parks and Recreations Committee in 1903, the Finance Committee in 1904, 1907, 1911, 1913, 1916, 1925-27, the Electric Lighting Committee in 1904, 1908-09, 1914-15, and 1919-20, the Street Signs Special Committee in 1906, the Queen Victoria Market Buildings Special Committee, 1910-11 and the Electric Supply Committee, 1921-24.